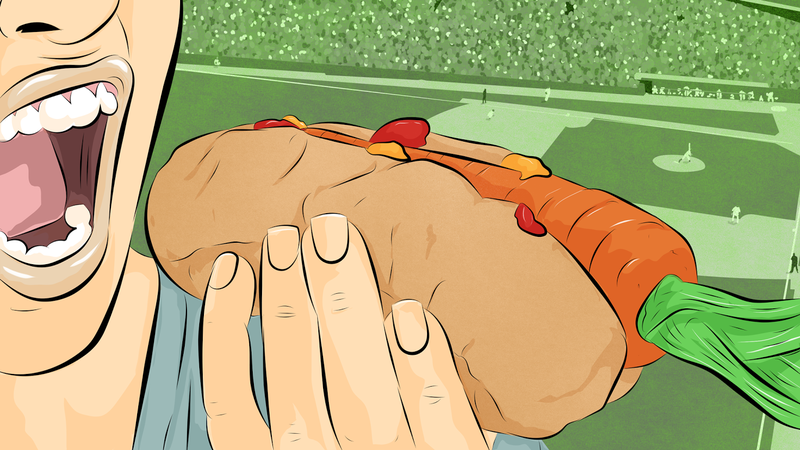 Stadium food is horrendously expensive and unhealthy, but it's part of the fun of a sports game. And even if you're trying to stick to a diet, you're going to be at the game for a couple hours - so as a human, you're going to have to eat something. Here's how to navigate the world of beer and meat pies. If you're used to sneaking your own food into the movies, you may be surprised to learn that you can openly carry an entire lunch into most Cricket pitches, and a lot of other sporting events too. This open secret saves calories and money. A typical stadium will let you bring at least one water bottle (plastic and unopened) and a reasonable amount of single-serving food - so a sandwich is fine, a whole pizza? Not so much. So if you're just concerned about making it through the match without starving, go ahead and pack a sandwich or whatever will make your belly happy. If you just head in to the stadium empty handed, with a vague idea that you're going to "eat healthy," don't expect to have much success. The temptations are many and intriguing. Foods like the classic Aussie meat pies, sausage rolls, hot chips, pop corn and assortments of soft drink and overpriced beer. Will you plan to fail, taking a guilt-free break from your diet for the evening? Will you consider this a limited indulgence situation, budgeting your calories elsewhere so you can have some treats? Will you spend extra effort scouting out the stadium's (perhaps very few) healthy options? Pick a plan and stick to it. To do that, you'll have to define what you mean: maybe you can allow yourself 500 calories of ridiculousness, plus a salad. Or maybe you'll pack a healthy lunch but plan on buying a few beers. Bottomless popcorn is a trap and you know it. Places with expensive food, like stadiums and festivals, make large portions feel like a really good deal. You might be paying somewhere over ten dollars for that popcorn, but you can have as much of it as you want. And to make sure you get your money's worth, you'll probably run back up to the concession stand between innings for a refill or two. Obviously, that's a diet-buster. Better to plan out ahead of time how much you think is ok to eat, and only have that much. If you really need a taste of that stadium grade nachos, split it with a friend. Meat Pie: the Aussie meat pie is a whopping 715 calories per serving. Adding the tomato sauce on top is another 16 calories, so still worth it in the long run. Popcorn: ranges from 400 calories for a 7-cup small, to 1500 calories for a 20-cup large with "butter"
Take advantage of some food psychology: if you go the old-school route with a box of popcorn, eating each kernel can help you feel full sooner. You're already at a disadvantage, though, when it comes to paying attention to how much you eat: distraction encourages you to eat more. That's why your pre-game plan is so important. So what do you do if you've shown up without a solid plan? Here are a few strategies that can help you pick the least bad foods available. Scope out all your options before deciding what to eat. This may take some time — great if you're the kind of person to arrive early. With a stroll around all the concession stands, you might find out that there's a place that offers salads, or a burger stand that has veggie burgers or grilled chicken options. Drink water, not soda. Pepsi and friends have a ton of calories, and they're pure sugar. Water (and sparkling water) is both healthier and cheaper, so strongly consider it. Seltzer and diet soda are good options if you want some fizz but would rather save those calories for a slice of pizza. Look for protein. You'll usually stay full longer if you go for a hot dog or a chicken sandwich than if you down the same number of calories in hot chips or popcorn. Fat also has this effect, but it can be more calorie dense, so decide if that's worthwhile for you. Watch out for sides and sauces. We know. It's hard to turn down free sour cream. But if a sauce or side isn't crucial to your enjoyment of the food, consider skipping it or only taking a little. After all, eating out at a stadium isn't all that different from eating out at a restaurant. Just know that you'll be in a place with lots of tempting options, and plan accordingly. Packing a snack and drinking some water already puts you in a better position than if you had just wandered in hungry and clueless. So now you'll be prepared the next time you take yourself out to the old ball game.